In case you hadn’t noticed, I’m on a bit of a pork kick… also, sweet potatoes are in season right now so it’s all about the pig and potatoes. If you follow me on Facebook then you saw all kinds of porky pictures from what I was calling “Pork Sunday”. I made carnitas and sausage and also rendered some fat… and to round it all out I had a farinata with prosciutto. We get the Food Network magazine and in one of the more recent issues, they had this Stuffed Sweet Potatoes with Pancetta and Broccoli Rabe recipe. I am not a fan of broccoli rabe. Also, that is not nearly enough food for me. So I took the general idea and ran with it..
woah.. that caption ought to get me some interesting search engine hits. Super quick, super easy. Use the microwave to cook your sweet potatoes and you can have this done in 20 minutes tops. Small container of baby spinach.. what is that like 12 ounces? 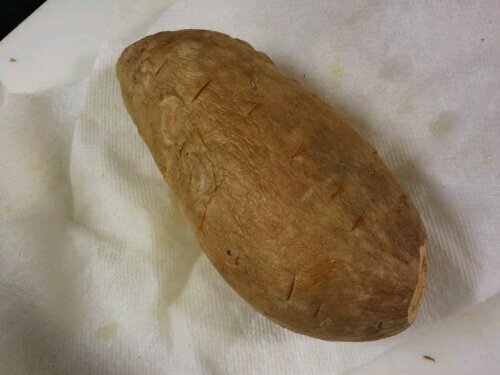 Stab your sweet potatoes all over with a knife and trim off the ends. Wrap each potato in a paper towel and microwave on high for three minutes. Flip them over and cook again for another three minutes. You may need to do another 3-6 minutes depending on the size of your potatoes and the strength of you microwave. Potatoes are done when a knife goes through to the center with little or no resistance. While the potatoes are cooking, brown your sausage in a skillet over medium heat. 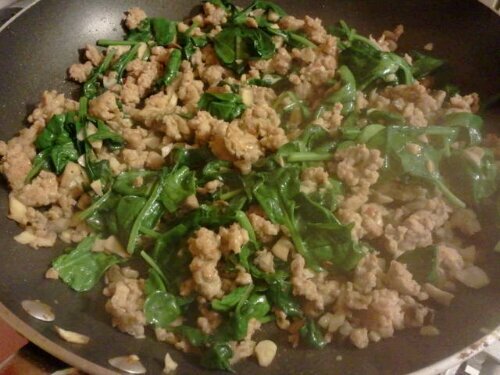 Toss in the minced garlic. 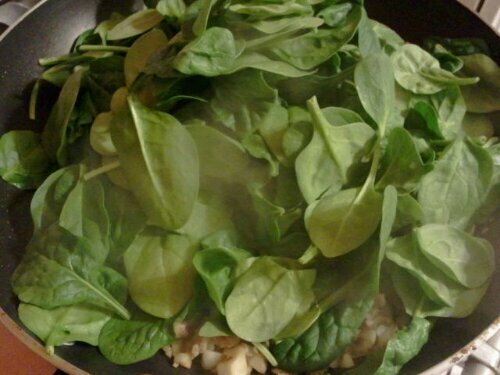 Stir in the baby spinach and let it cook down. Mix about ½ cup of ricotta with ¼ cup of grated Parmesan cheese. I like to add a little pepper here too. When you are ready to eat, slice the potatoes in half and score the flesh with your knife. 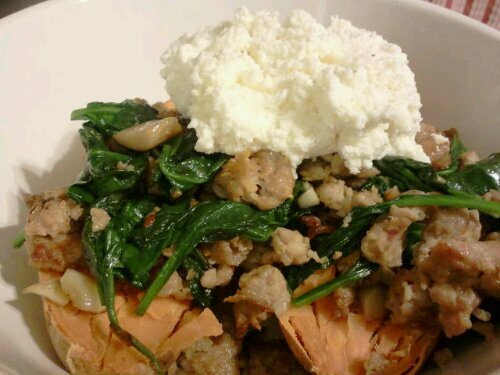 mushrooms, Quick Meals, Recipes, sausage, spinach, sweet potato. Bookmark.